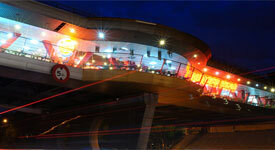 The Overhead Bridge Restaurants (OBR) are one stop rest areas that provide a variety of facilities for users. Straddling the Expressway, this one stop convenient centre is the first of its kind in the country, enabling users to enjoy the facilities offered at each bound of the highway. OBRs also give the users a chance to enjoy their meals at one of the air-conditioned restaurants as they view the traffic below. Among the facilities provided are air-conditioned restaurants, food stalls, convenience stores, restrooms, surau (prayer rooms), parking bays, children's playground, petrol stations and public telephones. Located at two major sites: Sg. Buloh and Ayer Keroh, these OBRs namely the Sungai Buloh OBR and the Ayer Keroh OBR are the preferred rest stop areas for many users of the NSE. 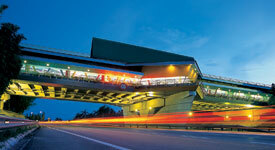 The Ayer Keroh Overhead Bridge Restaurant (OBR) was officially opened on 11 April 1999 by the Chief Minister of Malacca. The OBR is the second such facility on the North-South Expressway. 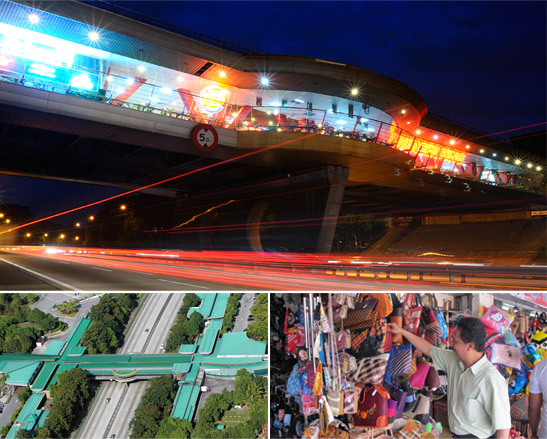 The Sungai Buloh OBR located between Bukit Lanjan and Sungai Buloh Interchange was officially opened on 25 April 1998 by Dato' Seri Dr. Mahathir Mohamad Prime Minister Of Malaysia.